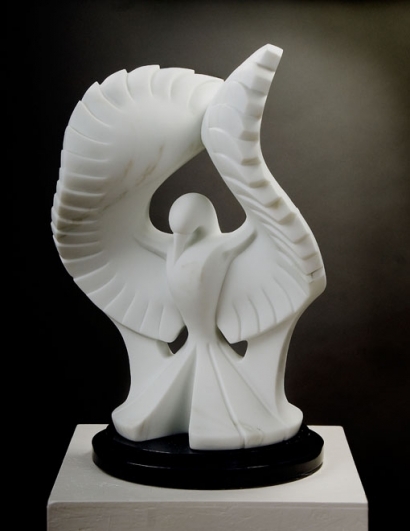 “Phoenix Rising.” was begun in July at the Marble/marble Symposium held every summer in Marble, CO. I have attended Marble/marble for the last 3 years. In June I started thinking about the sculpture I wanted to make and about what was most significant since the last symposium. “Phoenix Rising” was inspired by the help I received from the instructors, staff, and participants. These generous artists made my year remarkable and memorable. Their gifts of knowledge about all aspects of stone carving are valuable lessons I will use for years to come. To all of my teachers, I sincerely thank you! Your good energy is part of this creation. During the blocking-out process for “Phoenix Rising,” I noticed that the stone came off in separated, crumbly layers when I sliced off thin slabs. When I touched these thin layers, they didn’t fall off the block or disintegrate the way other thin slices of Yule Marble have crumbled in the making of other sculptures. I had to push on these crenulated fans in order to make them fall away. I mentioned this to Madeline Weiner, the Founder and Director of Marble/marble, and one of the sculptors to whom I direct many questions. She said this indicates a very strong bedding plane. This is the layers of seashells laid down 100 million years ago which were compressed to make the marble. I believe this very strong bedding plane is the reason why the wings are able to exist. They undulate through the bedding plane (the strongest axis) which runs vertically through the width of the stone. Both tips of the wings curve well away from this axis and yet they didn’t fall off in the process of creation. I feel like the stone was perfect for the design and allowed me to coax it into these curving shapes. I love this Yule Marble! Every bit of careful effort you put into your sculpting returns to you 10 times over. Successful forms, pristine color, subtle veining, and dazzling snowflake crystal are the reward. I wanted to explore the play of light on curved and faceted surfaces in this sculpture. In southern California, Brian and I lived in a house that had many doors, windows, and sky lights. Light came in from all angles. The interior of the house was painted white, and the rooms were designed with angled ceilings, inset spaces, and arches. The light came in through the windows and was divided into colors of the spectrum by the interior angles. One surface would have a rosy color and an adjacent, angled surface would have a bluish shade. That pretty little house inspired me. I was curious to see if I could divide the light into colors with the curved and faceted wings of my marble bird. (This idea is still untested as I have not had the opportunity of a sunny location to study the play of light.) The sculpture is meant to be exhibited indoors in partial sun–the marble and granite will not fade in sunlight. For me, this sculpture is about hope and new beginnings, a celebration of learning how to carve stone. I still have much to explore and I am looking forward to that process. I am pleased and encouraged by what I am able to create now. “Phoenix Rising” embodies my re-invention as a stone sculptor. This bird rises from the embers of one art form (animation) to inspire and inform another. Next summer I will return to the Marble/marble carving symposium for 9 days of carving glittering white Colorado Yule marble high in the Rockies in the woods in the rain (sometimes) with power tools. What a glorious image (!) and what an incredible experience it is–the creative highpoint of my year!